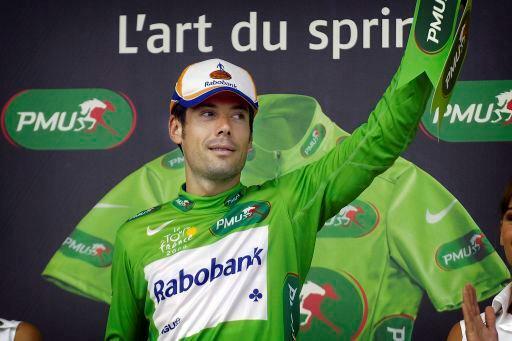 Ever since his amazing first rainbow jersey at Verona I have been a big fan of Oscar Freire. What’s more he often seems to talk sense so when he recently suggested that there should be no reinstatement of riders eliminated from the TDF I took notice. Freire was asked about Cavendish’s green jersey at the Tour de France despite finishing outside the time limit on consecutive days in the Alps. The size of the laughing group meant that Cavendish and the other riders involved were not eliminated from the race, but were punished by being docked 20 points from their tallies in the points classification on each occasion. Freire believes that the rules need to be revisited. Well said Oscar. From memory I think that one day there were seventy riders in Cav’s group of slackers, which is a joke. Of course the organisers wouldn’t want to send that many home but if the riders knew that the rule would be enforced regardless there would be far fewer taking a “rest day” Perhaps they could try a “no reprieve in the last week” rule to see how that works. International Journal of Sports Medicine publishes junk science. The following is an abstract of a report in the May 2011 edition of the IJSM produced at the Department of Physiology, Faculty of Medicine, University of Valencia, Spain. I havn’t read the full version and it is quite probable that I wouldn’t understand it if I had but I am singularly unimpressed by this research. There is no mention of the very many confounding factors that could explain the increased longevity of TDF riders so I will list a few. In this period the French drank vast quantities of cheap plonk and smoked trillions of unfiltered cigarettes. TDF riders did drink and some smoked but very limited amounts because the D.S. was on their case and you can’t smoke so much if you are racing and training seven hours a day. Their diet would be better than the average French worker. They took vitamin supplements including B12 injections. There are no women in the sample so half of the population can conclude nothing from this research. unlike the controls (the general population) the subjects are not randomly selected, they are a very special group of male athletes. Anyone who has trained with a successful long stage race rider, as I have, knows that a training and racing programme that will bring him to peak fitness will wear down an ordinary rider (eg me). They consumed industrial quantities of amphetimines. This probably didn’t help much with life expectancy but if there is a difference between the two groups it must be allowed for. I suspect that the “researchers” knew the answer they wanted before they started looking. It is widely held among the general population and even among health professionals that moderate exercise is a healthy practice but long term high intensity exercise is not. The specific amount of physical activity necessary for good health remains unclear. To date, longevity studies of elite athletes have been relatively sparse and the results are somewhat conflicting. The Tour de France is among the most gruelling sport events in the world, during which highly trained professional cyclists undertake high intensity exercise for a full three weeks. Consequently we set out to determine the longevity of the participants in the Tour de France, compared with that of the general population. We studied the longevity of 834 cyclists from France (n=465), Italy (n=196) and Belgium (n=173) who rode the Tour de France between the years 1930 and 1964. Dates of birth and death of the cyclists were obtained on December 31 (st) 2007. We calculated the percentage of survivors for each age and compared them with the values for the pooled general population of France, Italy and Belgium for the appropriate age cohorts. We found a very significant increase in average longevity (17%) of the cyclists when compared with the general population. The age at which 50% of the general population died was 73.5 vs. 81.5 years in Tour de France participants. Our major finding is that repeated very intense exercise prolongs life span in well trained practitioners. Our findings underpin the importance of exercising without the fear that becoming exhausted might be bad for one’s health. Back in the day I wasn’t much of a fan of Jacques Anquetil, mainly because he was the only rider who could beat my hero Ercole Baldini against the watch. That and the fact that he won the Tour five times in a manner that made Big Mig seem exiting. I havebeen reading Vin Denson’s book and Vin is a big fan of Jacques if only because his time with Ford France labouring for the Norman was the one time that he had a decent job as a pro. So I checked out my back issues of Sporting Cyclist and read about the 1961 Tour de France. Anquetil took the jersey on the first day in a time trial and held it for three weeks, God it was boring! In 1961 the Tour was contested by national teams and there was a British Isles team with Robinson, Simpson and Shay Elliott backed up by a motley crew including Denson, Stan Brittain and Ken Laidlaw. On paper it didn’t look half bad as that season Simmy had won De Ronde and Robbo had won the Dauphine Libere but within a few days Simpson had packed with a dodgy knee and the team was reduced to an Englishman Robinson, an Irishman Elliott and a Scotsman Laidlaw. But back to the first day and that time trial over just 28km. Robinson, who don’t forget had just won a major stage race and was looking for a high finish at Paris took 43min 38 sec. Denson, a good English tester had a time of 45min 55sec and Simpson was slower in 46min 32sec. And Anquetil? He took just 39min 43sec. and crushed second placed Bouvet, a world class pursuiter, by two and a half minutes and the rest beaten out of sight! So by the end of the first day the Tour de France was over. I took the photo at the 1966 Worlds on the Nurburgring. 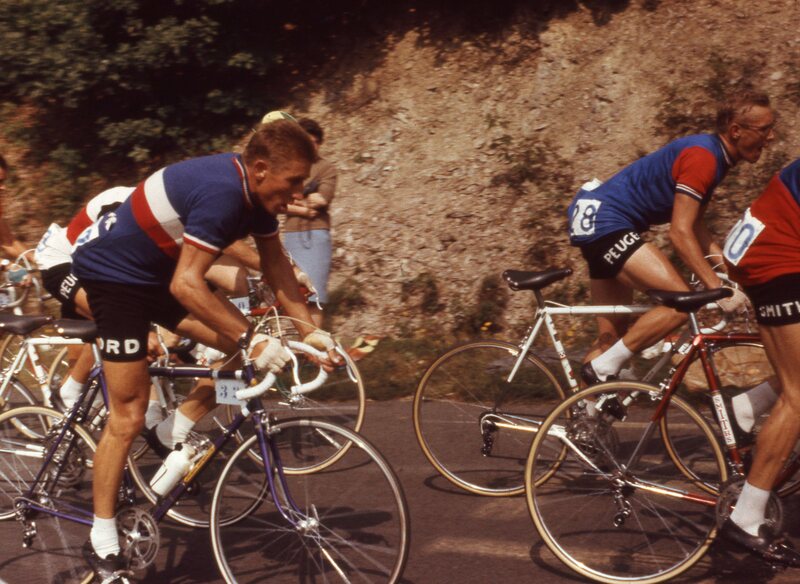 Anquetil was second to Rudi Altig. The GB rider is Alan Ramsbottom. Apparently it is thirteen years since a rider was disqualified from The Tour and I guess that must have been the Tom Steels “bottle throwing” affair. So clearly it takes a serious infringement to earn a red card. Certainly putting Farrar in to the barrier was naughty, but hardly exceptional if sprinting for the win but it could start a very nasty trend if lead out men started pushing and shoving while going backwards through the sprinting field. The problem is that if Renshaw is not DQed he has, in effect, got away with his indiscretion. The usual penalty of relegating him to last in the bunch would be a joke. After all he would still be placed in front of Armstrong on the day! Presumably a fine would be paid by the team and I have no idea what sum would constitute a deterrent but I guess 10,000 euros might hurt, but not much. I suppose if Renshaw deserves a serious sanction, and I can’t decide if he does, the only possible punishment is to send him home. Is it an Aussie thing? It would be, of course, churlish to offer any negative comment about today’s fantastic stage so I won’t. Who to single out for praise? well Armstrong for a start. The way he came back to the group, even if he did get more than a little help from the convoy, was fantasic. Thomas of course was super as was Evans and Andy Schleck. Cancellara was, like yesterday, great on the bike and a burk on the mike. In a short ITV4 interview he tried to distinguish yesterday’s stage, when it was wrong to race after a crash, from today’s stage when it was OK to race after a crash. Needless to say he just tied himself in knots. Did Jurgen yell for Cadel to wait? I just checked the result of the TDF ttt and noticed that Silence-Lotto didn’t wait for VdB when he fell. He lost seven minutes on Astana and about 4min 30sec on the rest of his team. I imagine dinner was a little difficult that night! 173rd Jurgen van den Broek (Bel) Silence-Lotto @ 7min. 04sec. This must surely be the best Tour ever for British fans, with all due respect to Brian Robinson and Robert Millar. I have not forgotten Tom Simpson but lets be honest he wasn’t much of a Tour rider. Cav has delivered as expected and Bradley Wiggins is a revelation, to me at least. Others may claim that they knew all along that he could climb with the best but it has shocked me. I have always believed that he could win De Ronde, if only because he has the same build as Eddy Bosberg, but I thought the Muur at Gerardsbergen would be his limit. But the ride that exited me the most was Millar’s epic on the road to Barcelona. When he clipped off 29km from the finish he left Sylvain Chavanel for dead. Yes the same Chavanel who has been the strong man of the Quick Step team all year. I don’t think he can use the “I was on a bad day” excuse or Sylvain would have stayed in the bunch not gone looking for a stage win. 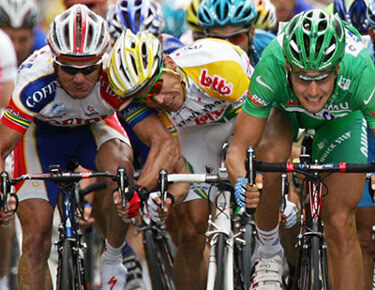 The truth is Chavanel was beaten by a much better man who truly deserved a stage victory.